Impressionist painter Paul Cézanne was born in Aix and did much of his work in this lovely city. 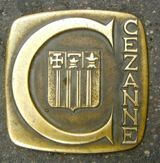 Paul Cézanne was born in Aix-en-Provence in 1839 and died here in 1906. He was inspired by Provence and is reputed to have said, "When you're born there, it's hopeless, nothing else is good enough." 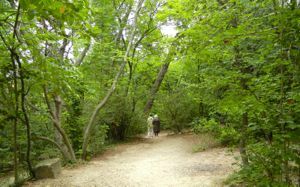 A walking tour, In the Steps of Cézanne, allows you to visit the many sites in Aix-en-Provence that were important to the artist. These include the house where he was born, at 28 rue de l'Opéra, and his grave in the St-Pierre Cemetery, on the eastern edge of the town. Cézanne's studio, at 9 avenue Paul Cézanne, on the north side of town, offers a glimpse into the artist's last years. This is where he painted from 1902-1906. Walking through the rooms and seeing the views he enjoyed gives a strong sense of the person he was. You can walk there from La Rotonde, in the center of Aix-en-Provence (about 1.6 kilometers, or just over a mile; map). Cézanne completed some of his most famous paintings here, including Les Grandes Baigneuses (The Large Bathers) and others in that series. 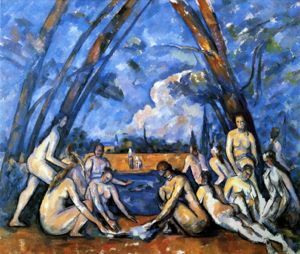 Les Grandes Baigneuses, painting by Cézanne. Cézanne's family home, Jas de Bouffan, is a bit outside of Aix-en-Provence, in a western suburb. 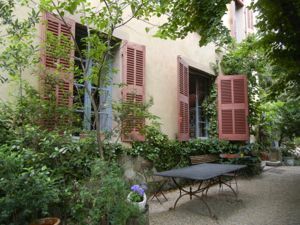 This was where the young Cézanne lived and painted. Between 1859 and 1899 he completed 36 oil paintings and 17 water colors here. The Granet Museum, once an art school where Cézanne studied from 1857-1862, now houses a fine collection of works by Cézanne. The museum owns nine oil paintings and a collection of water colors and drawings, which are exhibited only periodically to ensure their preservation. Other sites include the homes of various family members, churches where Cézanne baptisms and funerals were held, and offices and businesses connected with the family. The quarries are located about 5 kilometers (3 miles) east of Aix-en-Provence, accessible by bus and shuttle bus; check at the Tourist Office for details. Visitors can get a sense of the site and the remains of the quarried rock, which is said to have inspried Cubism. Wandering in the garden at Cézanne's Studio.